As I’ve mentioned previously, I recently purchased a USB turntable, so I can finally convert some of my more obscure (and generally, as it turns out, justifiably so) vinyl to digital. For the most part this consists of things such as the Hawaii Five-0 soundtrack (probably the most digitization-worthy piece in my collection) or the long-forgotten solo albums of members of Yes from 1975. But as I was shuffling through my LPs tonight sorting them into three groups (definitely rip, maybe rip, and not a chance in hell), I came across a most curious item. It’s a thick cardboard mailer for a 7-inch record, sent from my grandfather to my grandmother back when he was in the army. The postmark is from Camp Gruber, Oklahoma, August 11, 1944. The sound quality is pretty bad. I spent the better part of an hour on multiple attempts at cleaning it up, and this was the best I could get it. Still, it’s pretty interesting to listen to. Here’s my best shot at a transcript. Parts I can’t make out are indicated by […]. 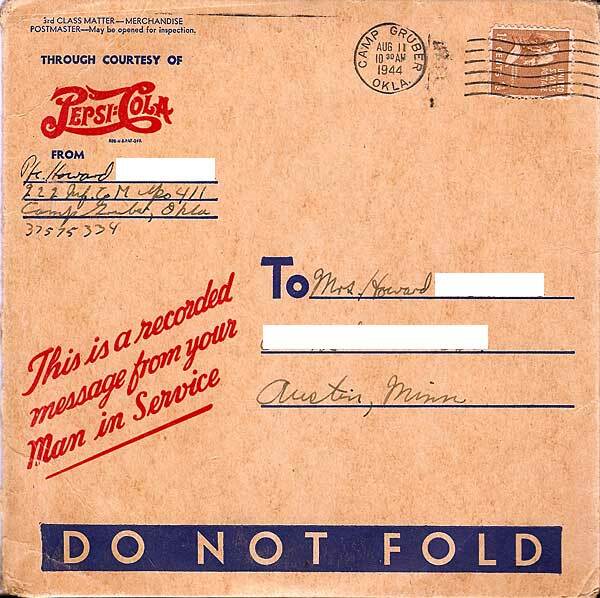 Introduction: […] the Pepsi-Cola company is proud to bring you this recording of the voice of your husband, located here at Camp Gruber in Oklahoma. Howard: Hello sweets, hello Tommy. You didn’t expect to hear daddy’s voice […] a package too. […] we were told we could send records of our voices home free. […] I know how much you — it means to you, angel, and of course Tommy. What I would give right now to be near you and see you. How’s everything? Do you really miss me as much as I miss you? How is everything out there? Fine? As a matter of fact, it couldn’t be better here. Oh, the […] food and kinds of […] just can’t be beaten anywhere. I wish you could see me. I’ve […] as much weight as you’d want me to carry and the muscles are comin’ right through my uniform. The days here pass like lightning and the nights here… well, all I’d need is you and the baby and everything’d be perfect. Give me the next best thing — keep writing. I can’t tell you how much your letters mean to me. How are the folks back home? Ask them to keep in touch with me; give them all my best regards. Love and kisses. The end, your husband, Howard. So long, angel. I’m glad to say he came home safe and sound after his time in the service. My mom was born 3 years later. I got to know my grandfather well over the years as I grew up. He left this life in 1996. It’s kind of weird to hear his voice (almost unrecognizable to me given how young he was — I was convinced it was not the right record until I caught a certain cadence in his voice that I just knew was him) in this recording. He’s been gone almost 11 years, and suddenly here’s this artifact from back when he was younger than I am now, and years before my mom was even born! He was a great person and I still think of him often. I make no attempts to conceal my lifelong obsession with the video games I played in my youth. My Atari 2600 and Intellivision are still hooked up to my TV, I have collected over 200 game cartridges for those systems, I own a pinball machine and an Asteroids cocktail table, I lurk in the forums at AtariAge.com, and I even have my own web site devoted to the topic. But I can acknowledge some of the, er, pitfalls of such an obsession. Yesterday a couple of friends and I stepped into the netherworld of arcade auctions. I went to a previous auction with one of them, and we each walked away with a machine in tow… I got the aforementioned Asteroids cocktail table; he took home a Ms. Pac-Man cabaret machine. Yesterday’s auction was a comparative disappointment. Again, we each had our sights on a particular machine: I sought a Dig Dug, he wanted Tempest. And again, we found what we were looking for… the somewhat meager selection of machines up for bids did nonetheless include a fairly-decent Dig Dug and a pristine Tempest. Unfortunately, both of us were under strict spousal orders not to come home with another game. I made a feeble attempt at bidding on the Dig Dug but ultimately let it go for a paltry $425. My friend didn’t even bother making a showing on the Tempest, which eventually closed at a surprisingly low, given its excellent condition, $900. Most people, unaware of their good fortune in this matter, have probably lived the last 21 years in the belief that this was the only song ever recorded by the joystick-jockeying duo. But the blissfully ignorant among us are wrong. So very, very wrong. In fact, Buckner & Garcia tried unsuccessfully to repeat their success cashing in on pop culture fads by recording a dreadful piece of rubbish entitled “E.T. I Love You.” But that wasn’t before CBS Records ill-advisedly inflated their “Pac-Man Fever” success into an entire LP… a concept album, no less, focused entirely upon the popular video arcade games of the day. Marketing types have a curious unwillingness to take chances on new ideas, combined with an uncanny ability to take one small, unexpected success and run it into the ground with lightning speed. Such was the case with Buckner & Garcia’s “Pac-Man Fever” album… eight B&G songs about nothing but video games! Of course, this was a bad idea. But once the ball (or in this case, the tape, or to avoid the mixed metaphor I am about to produce, the locomotive) is rolling, nothing can stop the freight-train momentum of a fundamentally-flawed concept with obscene amounts of cash strapped to its back. For those of you who’ve never heard the album, or have spent years in therapy trying to forget it, I’d like to share my recent experience, having brazenly subjected my ears and brain to the entire thing (not all at once, of course, or my head surely would have imploded before I had the opportunity to write this). The music is god-awful, to be sure. But I discovered something upon my most recent listening that I never noticed before. If you pay close attention, you can actually hear the evolution of the musicians’ mental state during the recording of the album. This is, in fact, a brilliant case study in what happens to people who’ve come up with a goofy but novel idea when they are pressured to draw that idea out far beyond its inherent appeal. This, of course, is the original idea, recorded well before the rest of the album. If I remember the story right, Buckner & Garcia were a couple of commercial jingle writers and performers based in Atlanta, who came up with the idea of making a song about their enthusiasm for Pac-Man. The song effectively captured the public’s temporary obsession with the game, and was requested so much by listeners to local radio stations that the guys got a record deal out of it. Unfortunately, that meant they had to actually record an entire record. I completely understand the decision to make a concept album. There is no way this song would fit with a program of serious songs. It had to be novelty all the way. But a better decision would’ve been to leave well enough alone. Fresh in the studio on the heels of their unexpected rise to fame with “Pac-Man Fever,” the boys put together this silly, but still fairly enjoyable little tune inspired by Frogger. They kept up the gimmick of using actual game sounds in the song, and engaged in some good-natured self-mockery in the form of bizarre, frog-like voices. But the concept was already beginning to fray. On the surface, this is a happy, bouncy, ’50s sock-hoppish dance tune, albeit one with horrifically stupid lyrics. But despite the perky tempo and forced enthusiasm of the singing, you can hear the band’s deep regret for ever having accepted the advance to record this album. To resolve any ambiguity (“hyperspace” being a staple in the concept of scores of space-themed video games of the early ’80s), this song happens to be about Asteroids, a game that is near and dear to my heart. One of the most exciting things about this game (aside from its gripping black-and-white vector graphics) is the awesome bass-heavy rumble its speaker generates when you blow up an asteroid. (Homer Simpson might even describe the effect as “bong rattling.”) So it’s quite painful for me to hear those beloved explosions in the context of this song. I try to avoid listening to it much, lest the unfortunately-catchy chorus should find its way into my head uninvited while I’m playing the game. By this point, Messrs. Buckner and Garcia were clearly just going through the motions, hoping to get the damn album over with as soon as possible so they could focus on their next big idea… a song about E.T. Buckner (or is it Garcia?) sings with almost-believable conviction here about his passion for his role as the “captain of the ship and its men.” But his profound sense of self-loathing is beginning to overwhelm the music. Then again, from the listener’s perspective, that’s probably a plus. By now, the band has basically worked through its issues. The guys know what they’re doing is hopelessly lame, but the end is in sight, and now their self-loathing is recast as a blatant contempt for the listener… an unmasked incredulity that anyone would bother to get this far into the album without flinging the disc out the nearest open window. I think the title says it all. Every turn of emotion the musicians endured over the 3 days they took to write and record the album merges with the others and a final picture comes together of the stark reality of what they’ve just done: Here, at last, we are left with a document of one of the most monumentally-stupid attempts to cash in on a fad in human history. Fads are defined by their temporality. Fads are, almost by definition, intrinsically ill-conceived. If they weren’t, they would endure. But they don’t. Sadly, they usually leave artifacts like this behind.